Social media are a prominent source of online news that allow Americans to curate the types of information they see on a daily basis. But social media appear to play a modest role in how Americans stay informed about science. While most social media users see posts about science on these sites, a smaller core of users see a sizeable quantity of posts or actively follow science pages. Social media platforms are proving themselves to be value-added sources of science information for some. Among social media users, 44% say they at least sometimes see science news they wouldn’t see elsewhere. But, many are also highly skeptical of the news they are seeing. Only about a quarter (26%) of social media users say they mostly trust the science posts they find on these sites, compared with twice that (52%) who mostly distrust them. About seven-in-ten Americans say they use social media, a figure that has gone up steadily over the past decade. 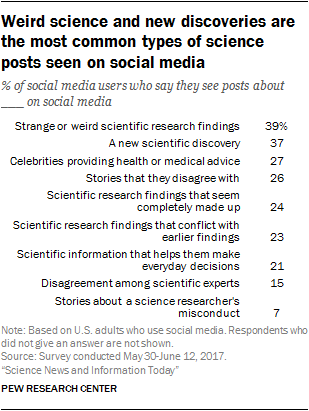 Among that group, 79% (55% of all U.S. adults) report seeing science-related posts on social media – but only 25% see “a lot” or “some” science posts, while about half (53%) see “not many” (21% of users see no posts about science). A minority of Americans are actively seeking science information on social media. 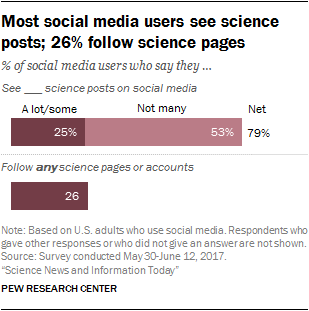 About a quarter (26%) of social media users (18% of U.S. adults) say they follow any pages or accounts that focus on science. 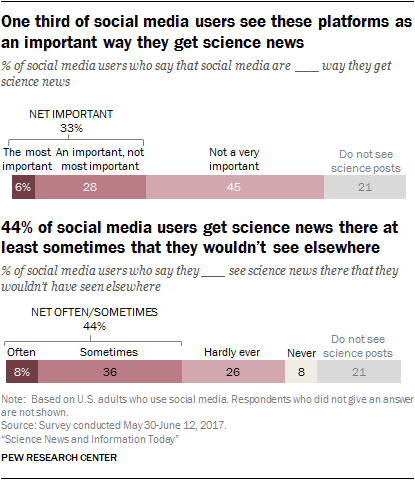 One third of social media users (33%) say that these sites are the most important (6%) or an important way (28%) that they get science news; 45% say social media are not very important in how they get science news. Younger adults are more likely to rely on social media for their science news. Roughly four-in-ten social media users ages 18 to 49 (41%) consider this an important way they get science news, compared with 22% of social media users ages 50 or older. An ongoing question about social media is whether they amplify news also seen in other venues or expose users to new content. The survey finds 44% of social media users see content unique to that platform at least sometimes, though 8% say they do so often. A smaller share of users, 34%, say what they see on these platforms is hardly ever or never something they would not have seen elsewhere. About two-in-ten social media users (18%) say they follow accounts that “provide alternative perspectives to conventional science or medical research.” Most of these users say they also follow traditional science pages (13% of social media users follow both a science account and an “alternative” science account; 5% of users only follow an alternative account). 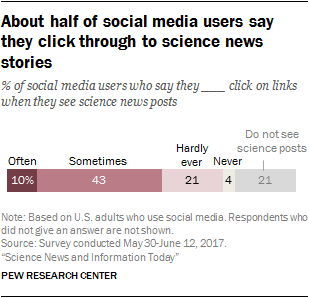 Most social media users click through to articles about science news outside of the sites themselves; 54% at least sometimes go beyond the post, clicking on external links to science information but, as with seeing posts overall, few do this often (10%). Most social media users are skeptical about the science content they see on these platforms. 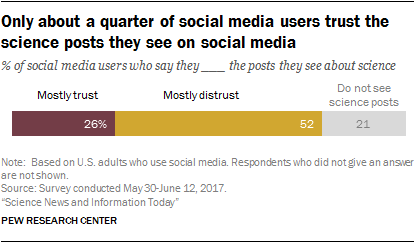 About a quarter (26%) of social media users say they mostly trust the science posts they see on these sites, compared with twice that (52%) who mostly distrust them. In terms of the specific types of science information that people get on social media, “strange or weird” scientific findings and new scientific discoveries are, by far, the most common types of posts seen on these platforms. A similar share of users (26%) report seeing science posts that they disagree with or that seem completely made up (24%). The survey asked respondents about any of five possible responses they have to posts they see that seem made up. The most common way people respond is to search for more information or, to a lesser extent, ignoring or hiding the story. Altogether, some 18% of social media users report taking any of five actions in response to science posts that seemed completely made up: commented on the story, searched for more information, shared the story to show that it is wrong, ignored or hid the story, or unfollowed/blocked the person or organization that originated the story. Fewer social media users report seeing posts about scientific misconduct (7%) or disagreement among scientific experts (15%). Fully 87% of science account followers click on science posts for content either often or sometimes, compared with 42% of those who do not follow such pages. 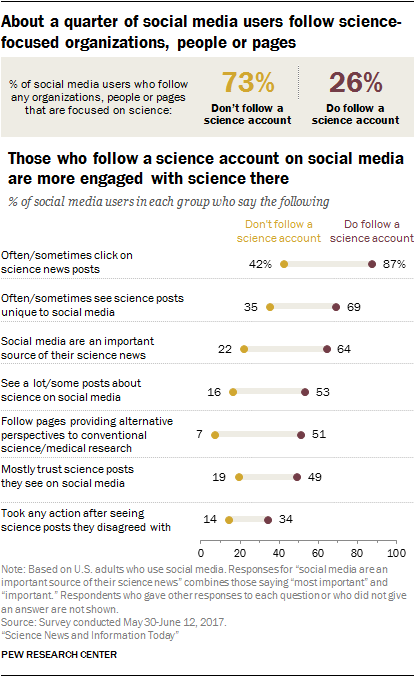 64% of social media users who follow a science account consider social media an important source of their science news, compared with 22% of other social media users. Social media users who follow science accounts are more likely to report seeing stories they wouldn’t have encountered elsewhere (69% say this occurs often or sometimes vs. 35% of social media users not following a science page). Those who follow science pages or accounts are closely divided over whether they mostly trust or distrust the science posts they see (49% to 49%). By contrast, 19% of those who do not follow science pages say they mostly trust the posts about science that they see there. When these more science-engaged social media users see posts they disagree with, they are more likely to report taking some kind of action in response. About a third (34%) of users following a science account have done at least one of the five actions considered in the survey: made a comment, searched for more information, shared the story to show that it is wrong, ignored or hid the story, or unfollowed/blocked the person or organization that originated the story. In contrast, just 14% of other social media users say they have done any of these things in response to a science post they disagreed with.